Brazilian Jiu-Jitsu is a devastating fighting and grappling art developed by the Gracie Family of Brazil. While it contains many stand-up throws, takedowns and self-defense techniques that can finish a fight, it is most famous for its extremely effective ground fighting techniques. This Martial Art was developed to allow the smaller person to defeat the larger person through the application of leverage and submission holds such as joint locks and chokes. Gracie Jiu-Jitsu is a versatile Martial Art. Its varied applications include a realistic self-defense system, a complete sport, a proven fighting style and a fun and healthy recreational activity. Because of its versatility, BJJ is quickly becoming one of the most popular Martial Arts in the world today. Brazilian Jiu-Jitsu aka Gracie Jiu-Jitsu is the art of ground fighting. Originally developed by the Gracie family for smaller guys in the country of Brazil, Brazilian Ju-Jitsu has evolved into an effective self defense system, a thriving sport, and an essential component of Mixed Martial Arts fighting (MMA). Gracie Jiu-Jitsu does not incorporate many of the fancy movements and complicated theories that other martial arts employ. In the real world, most fights end up on the ground and you have to be prepared for that scenario. 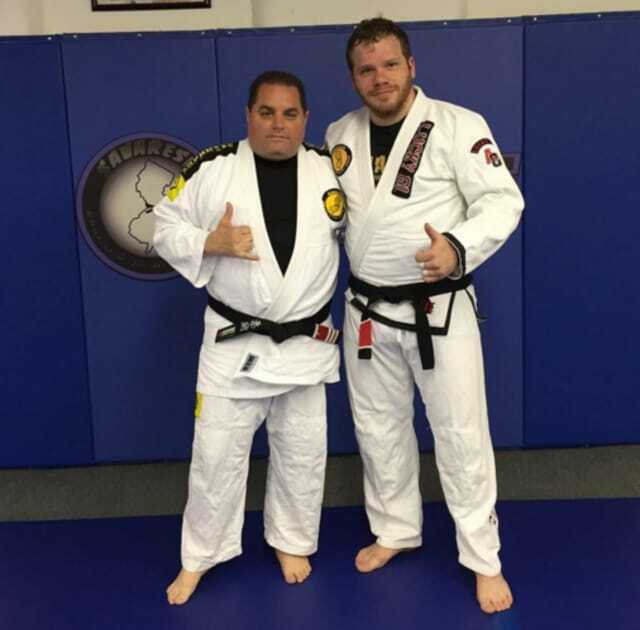 The Savarese Brazilian Jiu-Jitsu Academy teaches practical self defense techniques with a no attitude, no ego mentality. Students learn sport aspects and practical methods that don’t require strength or athletic ability. Brazilian Jiu-Jitsu was made for everyone. A typical class begins with a light warm up and stretch. Once everyone is loose, instructor Chris Savarese teaches students practical techniques and delivers personal care to ensure the class is learning and applying. Once the technique has been covered, live sparring for students who wish to participate is permitted. With Gracie Jiu-Jitsu, live sparring is an integral part of the art and what separates Brazilian Jiu-Jitsu from most other martial arts. In Gracie Jiu-Jitsu, sparring is encouraged and fun! The benefits of our Brazilian Jiu-Jitsu and Self Defense programs are endless! A greater sense of self leads to positive results in a world full of challenges. Our staff’s lineage goes directly back to the Gracie Family who created the art. Teach your children that perseverance wins over any obstacle in life, and let our program prove it to them! Develop functional muscles, not bulky, do-nothing muscles! Anyone who has trained at our academy for over a year will tell you that their life has been drastically improved! If you want to join the fastest growing BJJ Academy on the East Coast, Savarese BJJ is waiting for you! WHAT ARE YOU WAITING FOR? Come into our New Jersey Brazilian Jiu Jitsu Academy and take a free class! Give us a call at 201-933-5134.